24 Hour Care: When Is It Recommended? When care is needed around-the-clock, you have the option of choosing 24 hour care or live-in care. Both options ensure that a caregiver will be present during the day as well as in the evening and early morning hours. 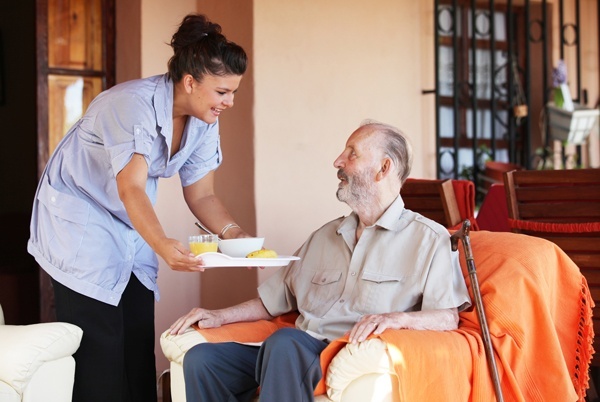 Advantages to these types of care over an assisted living facility or nursing home is mainly in the cost, and the ability of the senior, disabled individual, or post hospital recovery to be able to stay in their home. 24 hour care is also different from live in care, in several respects, as outlined below. Typically, 24 hour care, involves two caregivers who are scheduled daily, and they each work a 12 hour shift. In cases where it makes more sense from a medical or other perspective, there are 3 caregivers who will each work an 8-hour shift. These shifts do not involve a caregiver sleeping in the home to provide care, and caregivers, if they work a 12 hour shift, usually work no more than 4 times per week. As far as billing goes, 24 hour care is billed at an hourly rate. The advantages of using 24 hour care is that a caregiver will be with the person at all times, day or night. They will also be awake, during the night, and early morning hours, to ensure that your loved one has someone who can care for their needs, 24 hours a day. Many people prefer this option, especially if your loved one has a condition in which they wander, or need care at all hours of the day or night. 24 hour care allows caregivers to be more awake and alert because this type of care provides at least one caregiver to be replaced by another every 8 or 12 hours. The disadvantage of this type of care is the higher cost of care versus live-in care, because it is billed at an hourly rate versus a flat, live-in rate, which is lower. Live-in care costs typically are half the cost of 24 hour care. Also, 24 Hour Care has less continuity of caregivers making this less desirable where the client wants or needs a familiar face providing care. To help you decide which type of care is better, we suggest you request an In Home Assessment. The assessment allows us to meet with you and your family so that we can determine your unique needs. Together we will determine the best type of care for you or your loved one. Part of our assessment involves getting the input of your medical care team. This will help us make an informed decision which will take into account all of the medical, emotional, and financial considerations. To learn more, or request an in home assessment- call us at (800) 296-9962. To learn more about Live-In Care-see our article entitled: Live In Care: When Is It Recommended?